A central location overlooking the famous and scenic Spa Colonnade makes the Orea Hotel Excelsior Marianske Lazne a good choice of accommodation in Marianske Lazne for all kinds of travelers. A guest is just steps from the most famous springs including Caroline's, Ambrose's, and Ferdinand's Springs among many others. They are also near the Singing Fountain, Miniaturpark, Cableway and other tourism sites. 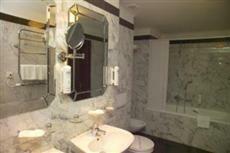 Guests are also conveniently close to the golf course, central park, and the casino too. The Orea Hotel Excelsior Marianske Lazne is located at Hlavní 121 and is 19.4 miles from the Karlovy Vary International Airport. Guestrooms in the Orea Hotel Excelsior Marianske Lazne are equipped with a minibar, room service, high-speed Internet access, a personal safe, and a large private bathroom. When staying at the Orea Hotel Excelsior Marianske Lazne visitors can look forward to such facilities as the popular spa with massage and beauty treatments, 24-hour front desk service, a lounge with bar service, laundry and dry cleaning services, an in-house restaurant, the sauna, airport shuttles, a concierge desk, a full-service tour desk, banqueting facilities, pet friendly policies, and free parking on the premises.